The Free Methodist Church has a rich history of stewardship, beginning with B.T. Roberts’ focus on the gospel for the poor. From our earliest days, the Free Methodist Church laid a firm foundation of stewardship –in our individual lives, in our local churches, and together as a denomination. FMF Financial Services is humbled to be part of continuing this rich legacy. The history of FMF Financial Services begins with the 1931 General Conference of the Free Methodist Church which called for the establishment of an Investment Committee to manage the investment of funds for the general church. In the early 1950s, the Free Methodist Church established the Church Extension Loan Fund (CELF) which took investments from Free Methodists and provided loans to growing churches while also providing interest to the investors. The Investment Committee assisted in administering this fund. The Investment Committee gained new responsibilities in the 1960s and 1970s. It first became responsible for investing the new pension plan for ministers, missionaries and church employees. In 1975, the Investment Committee broadened its services to the denomination by establishing the Division of Planned Giving to assist Free Methodists in their giving through outright gifts as well as planned gifts, including bequests and charitable trusts. In 1987, the growing responsibilities of the Investment Committee led to the creation of a new entity known as The Free Methodist Foundation (FMF), responsible to the denomination’s Board of Administration. The Investment Committee served as the nucleus of the Board of Directors for the Foundation. In recognition of a growing need for stewardship services to individuals and families, FMF expanded its services to include financial planning, individual and retirement accounts, as well as a donor-advised fund. These were offered under two new subsidiaries, GuideStream Financial, Inc. and GuideStream Charitable Gift Fund. Today, this family of services is now called FMF Financial Services. We stand on the shoulders of all those who came before us to establish a legacy of stewardship in the Free Methodist Church. We are honored to serve our denomination, its churches and ministries, and its individuals in accomplishing a life of Stewardship Well Done. Stewardship: When you step back and consider what difference your life will make to your family, your neighbors and your community, you’ll ask questions like these: “How do I best use the resources and opportunities that have been entrusted to my care?” “How should I manage my time, abilities, education, heritage and financial resources?” “How do I direct these resources…and toward what goal?” At the Free Methodist Foundation, we are committed to helping you answer these questions and experiencing a life of Stewardship Well Done. What is Stewardship Well Done? 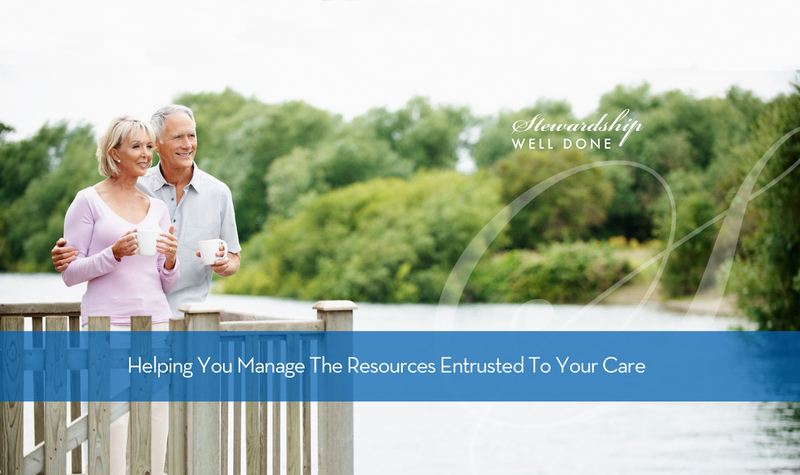 To us, it means effectively managing the gifts and resources entrusted to us by God. There’s a familiar passage in the Bible in which Jesus tells the story of a landowner who entrusts money to each of three servants. Later, he finds that two of the servants invested the money and watched it grow. The third servant buried the money, fearful that he would lose it. The two who put the resources to work were commended by their master. The third was sent away disgraced. Jesus tells this story to illustrate that, if we are good stewards with God’s gifts, we too will hear the words, “Well done!” So what has been entrusted to you that needs thoughtful management? Click here to begin the conversation or to find out more information about the resources available to you. things in life. You care about your children, for example; but in what ways do you care about them? Spiritually? Educationally? Financially? The same can be said for your community. You see, the answer to the question, “What does Stewardship Well Done look like?” and “What constitutes success?” is different for each person. But it begins by considering what you care about most. If you haven’t taken the time to articulate what you truly care about, we invite you to begin. You will be surprised and excited by what you discover! FMF can help you Begin the Conversation. navigate life’s currents to see results grow, and share this growth with others. We can support you by offering guidance in financial planning, expert investment management, estate planning, and charitable giving. Organizational clients benefit from the management of investment portfolios, retirement plans, funds in endowments and designated gifts. Free Methodist groups can also secure loans for building programs and other capital improvements to advance the work of your ministry. Please take a moment to review the items below. To begin a conversation please contact us or call 800.325.8975. No matter where you are in your life’s journey, you have plans for what you want to see happen next. Our role is to listen, understand your goals, then provide you with Christian financial life planning services to assist you in achieving your purposes and experiencing the joy of Stewardship Well Done. Staying the course by working your plan through the various stages and circumstances of your life. the opportunity to speak with you about how we can help you on your path of Stewardship Well Done. Consider getting in touch with us today to begin the conversation. Whether you are a Free Methodist church, ministry or educational institution, Free Methodist Financial Services can be of assistance in helping you achieve your mission. We serve 48 Free Methodist agencies, over 1,000 churches and 25 conferences. You can be in touch with us directly to learn more about how we have assisted other institutions by contacting us to begin the conversation. You can also discover more about securing loans by visiting the Investment & Loan Fund. We're delighted to work each day with individuals and organizations to help them live out Stewardship Well Done. You may be looking to shape your life vision and desire the peace and confidence that comes when you have a plan in place. You may want to simplify the management of your investments or you may need help in describing your priorties and incorporating them into your financial and estate plan. If you are a church, you may be looking to grow your ministry, but you need guidance in securing funds for your building expansion project. Whatever your financial services needs, we are ready to listen and respond. That’s where you start—considering important life questions, then determining your priorities. You see, it’s our delight to work each day with individuals and organizations to help them answer these questions and live out Stewardship Well Done. Is there something I sense God is calling me to be or to do? What do I dream of achieving? What does significance look like for me? 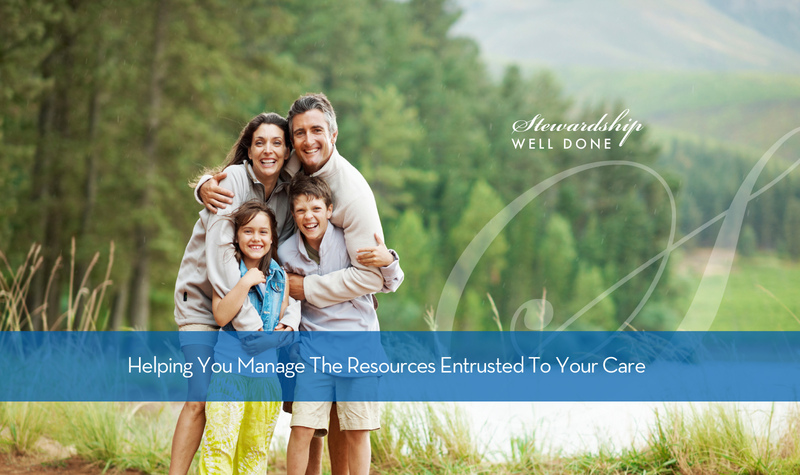 What can I do that is meaningful with my time, money and other resources? What goals do I have for my finances? For education? For marriage? For children? For service? The answers to these and other questions can help you build a Stewardship Well Done Life Plan that is both useful and true, and which will aid your decision-making in ensuing years. How can I best plan for my future? Have I made the right investment choices? I’ve lost a loved one; what do I do now? How do I best care for the people and causes that are important to me? For thoughtful solutions tailored just for you, Contact us today. Are you looking to share your life vision and are you yearning for the sense of well-being that comes when you have a plan in place? Are you in need of help describing your goals and incorporating them into your life plan? Do you want to simplify the management of your investments? If you are a church, are you looking to grow your ministry but you need guidance in securing funds for your building expansion project? Whatever your financial services needs, we are ready to listen and respond. There are three types of planning that you will do as part of your Life Plan: financial planning, estate planning and gift planning. All three of these can be done at any age and should be reviewed at every age. Our credentialed advisors can assist you in setting a course aimed directly at achieving your goals. To begin building your life plan, Contact us. The rewards become apparent the moment you start, and they never ever stop. Most people have never spent much time thinking about their legacy. It's just not the sort of thing people naturally talk about. Yet leaving a meaningful legacy is available to you, no matter how many assets you have. Creating a legacy that protects your family and advances the Kingdom of God is within everyone's reach. And we can help show you the way. So begin the conversation. Tim Burkhart is the Vice President of Estate and Gift Planning for the Free Methodist Foundation and President / COO of GuideStream Charitable Gift Fund. Tim’s primary responsibility is in providing leadership for the national field staff and strategizing major and planned giving opportunities. Tim is married to Marisa and they have three daughters; Miriam, Hannah and Sarah. Tim’s home church is the Light and Life Church, Avon, IN. Aside from his professional responsibilities, he enjoys music and has directed church handbell choirs, has been a leader for men’s groups, plays various brass instruments, both solo and in ensembles and minister's as a vocalist with his wife Marisa at the piano. Tim is a graduate of Indiana Wesleyan University and has spent more than twenty-five years educating himself in the area of finances, planned giving and estate planning. He is a graduate of Gift College, Crescendo Interactive (www.giftcollege.com) and is a Certified Gift Planning Professional (CGPP). He is a graduate of the National Planned Giving Institute from the college of William and Mary. He has taught Successful Money Management from a Biblical Perspective at the University level. Topics include building a foundation according to God's Economy, budgeting, retirement, saving, college planning and estate planning. Tim has served on the board of directors for Holy Light Seminary, Kaohsiung, Taiwan and has served as a board member and delegate for his church in the Wabash Conference. Tim is available as a speaker in the area of finances and stewardship for various charities and ministry settings. Rev. Steven (“Mac”) J. Macaluso serves the Eastern Region as Regional Vice President, an area which includes Alabama-Georgia, The Acts 12:24 Churches, Genesis, Gulf Coast, Keystone, New South, Pittsburgh, and South Atlantic Conferences. He also serves the educational and human service ministries of the Free Methodist Church which are part of these conferences. In addition to these responsibilities, Rev. Macaluso was elected as the Superintendent of the Keystone Conference in June of 2016. Rev. Macaluso has a passion for raising up resources for advancing kingdom endeavors. He considers his role with The Free Methodist Foundation a unique opportunity to take what he has learned in the pastoral, relationship and leadership experiences to serve the ministries in the eastern region of the Free Methodist Church. He has served as a board member of the Conference Board of Administration, Chairman of the Conference Church Planting Commission, Chairman of the Conference Ministerial Appointments Board, Chairman of the Conference Ministerial Education Guidance Board and a District Leader of the Genesis Conference Central New York Cluster. Rev. Macaluso is a graduate of Roberts Wesleyan College. He and his wife, Vicki, live in Holley, New York, where together they have raised three daughters. Scott Drury is a graduate of Southern Wesleyan University, Central, SC and the University of South Carolina School of Law. He is a licensed attorney in both South Carolina and California. Scott was in private law practice in Los Angeles for nearly a decade. Following that he served as Regional Vice President for the Free Methodist Foundation based in Southern California, and then Director of Resource Development for World Hope Int’l located in Northern Virginia. Most recently he has operated his own private law practice and served in a number of significant ministry consulting roles, including the Last Well, World Hope International, Teachoverseas.org, various divisions of the Wesleyan Church, and others. Scott and his wife Elizabeth have four sons: Benjamin, Joseph, Peter, and Jay. They live in Springfield, VA.
Chris DeBacker serves the central region as Regional Vice President. He also assists Central Christian College of Kansas, Deaconess Home Pregnancy & Adoption Services, Greenville College, Life Line Homes, Olive Branch Mission, Spring Arbor University and Woodstock Christian Life Services. Prior to his position with the Foundation, Chris was an investment specialist with a bank in southern Michigan where he provided comprehensive financial planning and investment services. He also worked as a field director specializing in insurance and investment planning for individuals and businesses, as well as managing and developing new agents. Chris has additional employment experience as a sales representative. Chris is a graduate of Spring Arbor University. He has earned the designations of Certified Life Underwriter (CLU), Chartered Financial Consultant (ChFC) and Certified Gift Planning Associate (CGPA). Arnie Brann is the Regional Vice President for the west. He also serves Seattle Pacific University, Warm Beach Christian Camp and Conference Center and Warm Beach Senior Community. Arnie is a finance and accounting professional. He has worked both in the public and private sector. His longest tenure was with Deloitte, where he worked 20+ years, 20 of which were as Director of Finance. He currently serves as treasurer for the Pacific Northwest Conference. Arnie is a graduate of Washington State University. Arnie's wife, Bonnie, is an ordained elder of the Free Methodist Church and is Senior Associate Pastor at Seattle First Church. They have two grown daughters and five granddaughters. Dave Moffitt serves The Free Methodist Foundation as a part-time regional representative. Dave was born and raised in Kokomo Indiana. He has an extensive business background, business consultant and entrepreneur. As a Regional Vice President he supervised over 350 Family Dollar Stores before taking an early retirement in the Spring Arbor area. He now spends a significant amount of time with friends and constituents in Light and Life Park in Florida. He has helped launch their recent campaign to build a new pool, reorganize their golf course and improve the park's financial condition. Dave and his wife, Jane have 2 sons and 3 grandchildren. He enjoys spending time with friends and watching his grandchildren play sports. Cary Holman is a part-time Regional Representative for The Free Methodist Foundation supporting the central region of the Free Methodist Church. He works with Chris DeBacker. Cary is also Associate Professor of Communication at Greenville College in Greenville, Illinois. His duties there include teaching sections of speech communication, mass media courses, and managing the college's radio station WGRN-FM. Cary lives in Greenville with his wife Tonya (Chilcote). They have two grown daughters. Cary and his wife are active members of the Greenville Free Methodist Church. Cary is an active amateur radio operator, sings in the church choir, has served as one of the church sound techs, and has acted as secretary of many organizations. Carol Duberowski serves as Regional Representative in Southern California. Carol is married to Dave Duberwoski and together they have one son Nate. Carol has had many roles in her local church at Light & Life North, in the conference, in Southern California and has helped lead various church planting projects in Long Beach. She has a huge heart for missions; and has been to Ethiopia as well as Israel. Her love for Missions spills over into the work of several of our Free Methodist Missionaries. She serves in an executive role at a company in LA and has had other executive positions at various companies throughout her professional career. She has served on non-profit boards and committees both inside and outside of our church in Southern California. She is presently on the Ministers Appointment Committee and is serving on the Conference Board of Administration.